Sydney Burns scored 19 points to lead four Wilsonville players in double figures as the top-ranked Wildcats rallied in the second half for a 71-59 Northwest Oregon Conference road win, snapping La Salle Prep's 83-game league win streak -- a string that stretched over eight seasons. La Salle's Lauren Vreeken worked inside for a basket the cut Wilsonville's lead to 58-50 with 6:42 remaining, but that was as close as the Falcons came down the stretch. "That something that the girls have been working for, for a long time," Wildcats coach Justin Duke said. "If you want to be the best, you've got to beat the best, and La Salle has been the measuring stick for 5A girls basketball for the last four years. 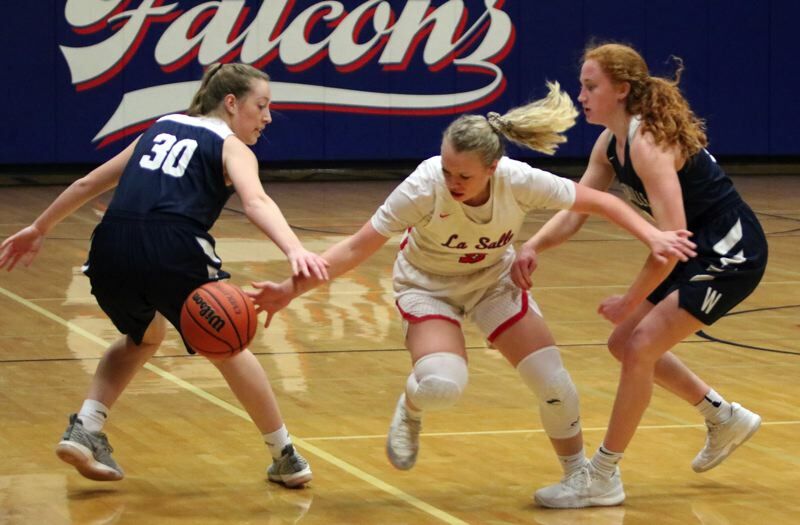 Tuesday's loss was La Salle's first in league play since a 68-35 loss to Madras on Feb. 17, 2012, and snapped a string that had seen the Falcons go undefeated in league play each of the past six seasons -- two in the 4A Tri-Valley Conference and the last four in the 5A NWOC. "It's just another thing that's going to help identify who we are, what we're made of, what we want to do, and the things we need to do to get better in order to achieve what we ultimately want to achieve." There were three times in the first half when Wilsonville led by as many as seven points -- the third time when senior guard Cydney Gutridge knocked down a 3-pointer from the top of the arc to give the Wildcats a 32-25 lead with 3:59 remaining in the second quarter. Instead, the Falcons went into a tailspin, coming up empty on six of its next seven possessions while running into their own foul troubles with Lindsay Drango picking up her fourth, Amanda Sisul her third, and Addi Wedin her fourth -- in that order and all in a span of 33 seconds. Wilsonville (71) -- Sydney Burns 19, T. McNamee 12, Timm 10, Bishop 8, Gutridge 11, Hieb 9, Lee 2, K. McNamee, McKinney. La Salle Prep (59) -- Emily Niebergall 18, Wedin 14, Loboy 9, Sisul 2, Skoro 12, Vreeken 4, Drango.